This post will walk you through my proposal for GSoC’15 @ GNU Mailman. Along with, it introduces the Mailman project and it’s parts. mailman-core: The core mailman module. It offers command line tools for using mailman. It has a REST server interface too, with so you can use http requests for talking with mailman-core. postorius: The Mailman web UI to do management tasks like CRUD operations on lists, domains, list_members, list_moderators etc. It depends upon mailman.client for talking with mailman-core. mailman.client: It talks to mailman-core’s REST server and provides API to postorius to do various operations. hyperkitty: A web interface to access GNU Mailman v3 archives. Why a seperate JS client ? Using the mailman.client one can only build Python applications that talks to mailman-core. The port will facilitate developing apps using Node.js/IO.js as well. The new client can come handy in situations where real-time statistics/accounting dashboard apps for Mailman are desired. So it would be good to identify the set of functionalities/endpoints to cover within the new client library and the best option would be to start with understanding what the current client offers and what’s missing. Also, the current client have hard-coded REST API endpoints in it’s code. This would break the mailman.client if someone decides to change the REST API endpoints in future. The API users should have some sort of easy way to configure these endpoints without having a look at the code. The best option that I can think of now would be to use a config file ( INI, YAML or JSON ) for defining these endpoints or to have a command line utility for the user to change endpoints if required. It is obvious that these endpoints aren’t changed quite frequently but from my point of view it is a good software practice to have such flexibility. The developed API would be friendly to Node.js developers and not like the existing Python API because we already have a Python client, but the functionality offered will be the same as discussed earlier. It would provide surety that the requested data from the server-side is written to the client-side and now you can do further processing on it. This can be achieved by writing the request making methods get() , post() , put() , etc. in asynchronous way because they will pose blocking calls; so that callback function can be invoked after these request making functions have got the required data from the server side. For eg. Note : The order of chaining may seem ambiguous at first as client.auth().lists() would be preferred over client.lists().auth() but I have mentioned the latter in context with the Proof of Concept module 0 for this project. There is no doubt to use the former while developing the actual client or authentication can be made implicit when a username and password is supplied during client instantiation. Fetching lists matching a given list name. List with most members etc. Upon successful implementation of the above features in the new mailman client, feature-requests for these can be added to the tracker of the mailman.client so that these can be integrated in it also. The idea is to have a base request handling class that will provide methods to do dispatching of the request eg. get(), post(), put() , etc. and handling of responses i.e pagination support etc. It will also have methods to build the final URI to request from a state object passed to it. Let’s call this class RequestA. Further this class can be extended for adding support for client side filters if someone wants to implement. Let’s call it RequestB. It would be good to handle the same category of endpoints by a single class. Like a ListRequest class for handling /lists/* endpoints. Another idea is to make other classes such as ListsRequest i.e those created to offer the functionality of _List , _Domains etc. 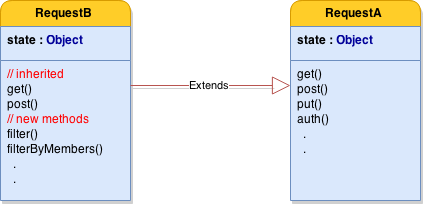 as in mailman.client to inherit RequestB with the exception of the main Client class which will be the entry point for passing the state object. This will enable request dispatching directly from any ListsRequest instance using inherited post(), get() etc. A drilled summary of what functionality is needed to port and what don’t is here : https://github.com/black-perl/mailman-cli/tree/master/readups/mailman.client-python-port-to-js . Vanilla JS with a request library and a promise library will be sufficient. As, Node.js will automatically take care of most of the browser differences. ** I have made use of Superagent in my Proof of Concept for this project 4 because it offers call-chaining style syntax like JQuery’s Ajax calls and I am pretty used to it. But Request is more popular than Superagent in the Node.js community. So, I would propose to use Request. Another promise library that can be used is es6-promise ( https://github.com/jakearchibald/es6-promise ) as pointed out by Florian on the mailing list. Writing legible code: A good idea is to use JSCS 6 to force code styling and JSHint 7 to lint code for potential errors and problems in the code. Writing less complex code: Decreasing the time complexity of the code can help in increasing the performance of the library. Well, Plato 9 is a great tool to do code visualization, static analysis and complexity. Once the parts of the code causing issues are identified, they can be improved. Also most of the npm packages are compatible with IO.js as suggested by the IO.js website 15 but some of the dependencies may cause compatibility issues. In these cases such tools can prove to be helpful : https://github.com/mderazon/iojs-dep-check . Similarly, YUIDoc 18 can be used to serve the purpose of generating documentation from inline comments. But it is required to have a separate usage documentation for the API users and it is equally important to work on it parallel to working on writing the library. Bug Found #1425359 : 500 error code shown by postorius instead of 409 error code. Bug Found #1428169 : client not present in the scope of the interpreter invoked by doing python manage.py mmclient. Bug Found #1428543 : Typos in the postorius code which potentially can lead to unwanted code cascading problems. Bug Found #1429366 : Anatomy of list ids does not keep with that of urls causes some REST end points to return 404 always. Given that I am already a Mailman contributor, I am up to speed with things and look forward to start this project as soon as acceptance is known. I have already got a good idea on the working of the existing mailman.client while working on a pull request for the bug #1429366 and writing a proof of concept thing has already given me a start on this. After studying the current implementation of mailman.client, it is clear to have the functionality offered by the classes _Page, _Settings, _Preferences etc. before trying to have any other functionality because they are directly or indirectly used by other core classes such as _List, _Domain, _User etc. So, a good idea would be to find such classes and implement them first. Note : The names of the classes used in the milestones follows directly from the implementation section as discussed earlier in the proposal. Take all of the choices of libraries in account and choose best of them to serve the purpose. Get my hands dirty on these. Setup development environment with the selected toolkit. Implementing the request making functionality by writing RequestA and RequestB classes by using some client side filters which can prove to be good assets by discussing with mentor(s). Write tests for these classes. Implement the core Client class along with classes analogous to _Page, _Settings, _Preferences etc. as discussed above. Implement rest of the functionality i.e classes analogous to _Member, _User, etc. Generate documentation of classes and methods in the library by making use of documentation generation tools as discussed earlier. Do code linting and performance tuning using tools described earlier. Final test suite touch ups to increase code coverage. Detailed documentation for the usage API. Making the library a npm package and publish it to the npm registry. There may be some functionality added to mailman.client during the GSoC period. So, the goal would be add this functionality in the new library. Further improvements or additions to the documentation. I have written a npm package that prototypes some of the expected functionality of the library aimed to be developed through this project. I have taken full care of code quality and expects it to serve as a proof of implementation of my proposed ideas.